The history of mankind has shown that information is the fundamental leverage factor for our mental development. The most profound moments throughout time have to do with changes in the way information was communicated, stored, processed. After inventing language and writing, the most important development was the modern communication networks. And now, the tablet. What makes tablets so powerful is their inherent interactivity and intuitiveness. The Economist had a great article about Grace Wambui, a 14-year-old pupil in Nairobi, who was given a tablet at school. Having never touched a tablet before, she figured out how to use it within a minute or so. And she is old. My own niece, 18 months old, figured out how to see videos and photos on my tablet, after playing her favorite games. She learned how to play the infamous birds game and her favorite memory-cards game, while she could barely speak. Now, that’s a breakthrough. If we, as infants, develop through interaction, then tablets are our mental steroids. The App Store and Google Play have tons of tablet apps for infants, teaching them vocabulary, numbers, even basic arithmetics, while having lots of fun along the way. We are talking about kids that can’t even properly target a mouse cursor, yet they can navigate and use a tablet to get the entertainment they want and the education they need. This trend carries on to adulthood. The tablet is where we actually seek information, we do the heavy reading, where we watch video and photos. We allow ourselves to a more relaxed experience and more efficient way when it comes to absorbing information. People at their homes have changed their attitude; from a “lean-back” (TV), to a “lean-in” (PC), back to a “lean-back” (tablet). Access to information is now easier than ever and the learning environment of the learner is now more relaxed, supporting the learning process. Ok, we have smartphones; but smartphones are mostly about communication. Mobile Learning is different, in that the tablet is not as personal as a smartphone, nor do we carry it around all the time. Tablets are heavier and have larger screens, so you cannot hold them for a long time, but you can use them for long sessions without eye strain. Exactly what a learner needs. And do not forget about the thing that “makes the world go round”; the tablet is cheaper. Schools, governments and all sorts of organizations always look at the financial side of things. Austerity and budget cuts push everyone to low-cost tools, preferably “mobile” (as in “easily transferred”) and do not require other facilities, like a computer lab, power or tech support. Emirates Airlines is using tablets coupled with custom developed applications as performance support tools for crew-members. Western countries, but also developing countries, are subsidizing tablets for schools and government organizations. Brazil has announced plans to hand out 600,000 tablets out to its public schools. The US FCC forecasts $3 billion savings from using tablets at schools. They are moving fast. For the average home, tablets will slowly replace the TV. From our early childhood, the TV was an important source of information, stimuli that our brain processed and got trained by it. The tablet serves that same role, but does so interactively. Moving to the school environment, the tablet will provide access to structured learning material, ebooks, libraries, and will soon be obligatory to bring it along at school, like we did once upon a time with books. And at work the tablet will be a permanent complementary tool both to everyday work tasks and to reference and training material. 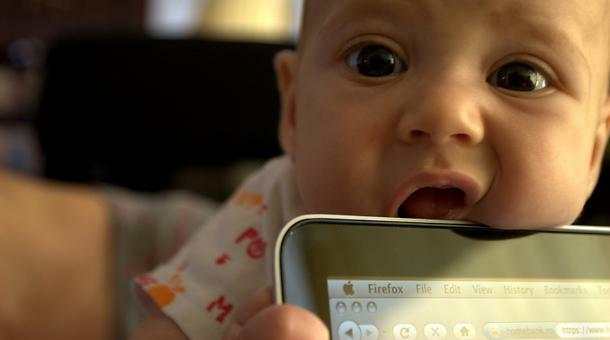 From an infant to a grown up, the tablet is here to boost our mental development and efficiency. Sent from my iPad. I feel smarter already. This post was submitted by guest blogger Kalliopi Sigala. This post was submitted by Rosalie Ledda. Rosalie blogs about elearning in Spanish and can be found on LinkedIn. With the eruption of the iPad there is plenty of questions about its use. Do we have to replace textbooks in schools for tablets? Should companies think of adapting their content to be viewed on tablets? According to 2012 NMC Horizon Report Higher Education Edition tablets present new opportunities to enhance learning experiences when compared with other devices. Tablets are considered less disruptive than smartphones because there are no ringing and no incoming messages that can distract the learners. But what the report underlines is that the iPad has revolutionized the way in which people interact with the content. People now can swipe pages, pinch to zoom in or zoom out over the images, maps or even tap on the screen and run a video or a song. Suddenly, the content has become interactive, it has become engaging. But what are the benefits of using tablets compared with textbooks? The first that we can recall is the way the content is presented. The content in a tablet is usually more visual and more interactive, so more engaging. The second advantage is the ease of updating the content comparing with textbooks. The following artcile: http://www.mobiledia.com/news/136174.html explains that the FCC spends about $7 billion per year on textbooks. However, many of them are seven to 10 years out of date. Is the iPad really a temporary fashion? Counting up until today, there is not a lot of evidence about the benefits of using tablets in educational contexts. However, there are schools and companies that have embraced the use of tablets in learning contexts and some have completely exchanged textbooks for tablets. The article mentioned above explains that Publisher Houghton Mifflin Harcourt tested an interactive version of an algebra textbook for iPad in California’s Riverside Unified School District. The results showed that those who used the digital version scored 20 percent higher than those who learned with textbooks. The research was grounded on Task Technology Fit (Goodhue and Thompson1995) and social learning theories. The research revealed some interesting conclusions. Some students said that the use of a tablet PC enhanced their learning experience. Students also pointed out that it was useful in tasks like sketching diagrams, graphs and maps. It also seems that what became important to the learning process and contributed to extent the use of the tool was the group. But the most important conclusion was that the research suggested that the extent of use of the Tablet PC was due to two factors: task, technology fit and social influence. Then, why do not we replace textbooks for tablets? Despite the good results showed when using tablets for learning, it is not that easy. There are some issues to take into account. It is necessary to invest in infrastructures, improve servers to guarantee the communications and train users. Another obstacle when learning with tablets is that content usually has links to click on so it easily changes the subject and can eventually lose it. From my point of view and according to the different experiences that I have read I think that to exchange textbooks for tablets is not the best decision. Learning on tablets is good to reinforce learning, to put in practice knowledge and practice skills. But when it comes to learning new content or memorizing concepts it is better to use textbooks for learning rather than tablets. Therefore I think it is better to think first what are the learning outcomes and define the best methodology and the resources to reach them out. The following is an excerpt from an article published on Techcrunch.com. Forrester’s latest report on mobile adoption in the enterprise found that 66% of employees now use two or more devices every day, including desktops, laptops, smartphones and tablets. A smaller, but notable 12% percent said they now use tablets at work. That’s still far fewer than the 50% who report only using a desktop, or the 82% who use a desktop alone or alongside other devices. Meanwhile, 55% of organizations stated that supporting a larger number of smartphones was a high or critical priority over the next 12 months, while 52% said the same of supporting tablets like Apple’s iPad. A somewhat remarkable 16% of workers said they use four devices at work, but that number may have slightly shifted from earlier this year, when 20% said they used “four or five” devices. Back then, 22% said they used two devices, 18% said three, 20% four or five, and 14% said six or more. 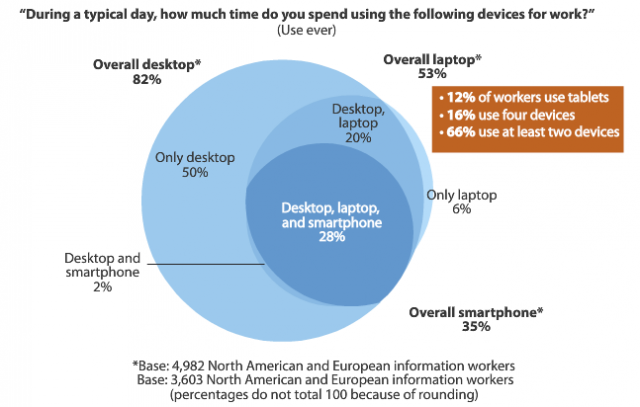 In other words, workers using 2 or more devices was at 74% in February, and has now dropped to 66%. Missing in Forrester’s analysis today was whether or not workers switching from PC alone to tablet alone had any impact here, but it’s worth noting that at the time of the last survey, tablet usage was at 7%, and it’s now 12%. Many organizations are now supporting “BYOD” (bring your own device) policies, which, to some extent, accounts for the wide variety and numbers of mobile devices in the workplace. For example, 70% of tablet users got to pick their own, while only 15% of companies issued the tablets directly and 13% had to choose it from a pre-approved list. In terms of smartphones, those numbers were 67%, 15% and 15%, respectively. Forrester says that 54% of organizations are now focused on developing a comprehensive policy to support employees bringing their own devices. With the numbers above, though, it seems that there are many more workers picking their own tablets and phones than their organizations with an “official” policy. Forrester’s research comes from survey data and in this case, over 2,300 I.T. mobility decision-makers and nearly 5,000 end user workers in North America and Europe were surveyed. For more on Forrester’s report on mobile adoption in the enterprise, please visit their website: http://www.forrester.com.